Off South Carolina, the ocean suddenly changes color, from green to deep blue. You’re in the Gulf Stream now, in warm and salty water from the tropics, with swordfish, tuna and squid, in a current so strong that it lowers our sea level. Benjamin Franklin would learn about this current’s force. He was a Colonial postmaster before the American Revolution, and he’d noticed British mail ships were slow, much slower than other merchant ships. Why? 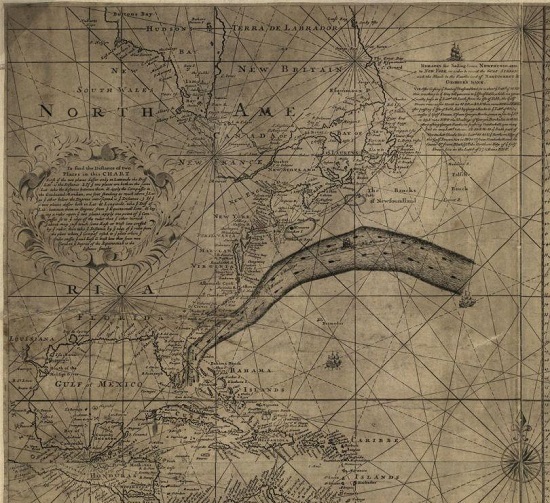 A map might help, and so they made a chart of this “Gulf Stream” from Florida toward Europe. It was one of the first maps to document its tremendous reach.